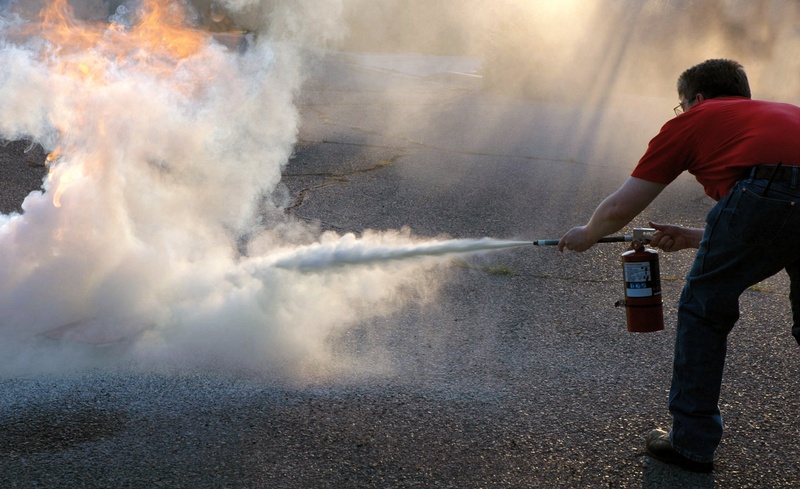 Should I still have Dry Powder Extinguishers in my premises? It is not often that changes in British Standard recommendations are applied retrospectively, or indeed that amendments really register significantly beyond the companies that work with the particular standard on a day-to-day basis. However, comments regarding Dry Powder Extinguishers in the 2012 amendment to BS 5306-8, which deals with the selection and placement of fire extinguishers, have come onto the radar of Health and Safety professionals, and Powder Extinguishers are starting to disappear from premises. You may be asking, should I still have Dry Powder extinguishers in my premises? Well, here are the facts to help you make sense of it. This statement basically shouts ‘Powder’. The very fine powder particles spread far and wide and will corrode metal and damage IT equipment, machinery, food and even some building fabrics. Of course, failing to put out the fire will do even more damage, but the standard is really saying, if you can use a medium which will cause less damage than powder, then you should do so. The second reference specifically addresses the possible harm to people, caused by the use of Powder Extinguishers: Clause 5.4.3: The discharge of a powder extinguisher within buildings can cause a sudden reduction of visibility and can also impair breathing, which could temporarily jeopardise escape, rescue or other emergency action. For this reason, powder extinguishers should generally not be specified for use indoors, unless mitigated by a health and safety risk assessment. 1) Running fuel fires – i.e. if you use flammable liquids and there is a possibility of spillage. If you have these risks on your premises, you will have no choice but to keep the Powder Extinguishers in place, and training will be required to ensure that staff use the extinguishers safely and appropriately. If you need help deciding on the best course of action, please give us a shout on 0330 7000 555.